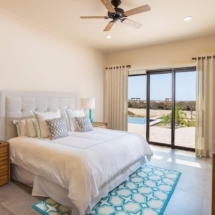 Accommodations at the Diamante Cabo San Lucas in a 3 Bedroom Golf Casita (Quad Occupancy). Eighteen holes sit among some of the most dramatic sand dunes this side of Ireland’s Island Golf Club. 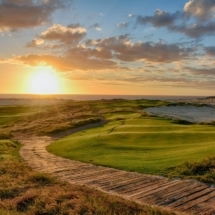 “You’re either playing toward the ocean, along the ocean or away from the ocean,” says course designer Davis Love III. 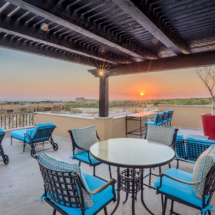 “And then, at times, you’re down in the dunes and you pop up and are surprised all over again by the incredible views of the ocean.” It’s the only Cabo San Lucas course located on the Pacific side of the Baja Peninsula. 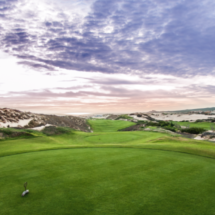 It’s also one of the most dramatic meetings of desert, white dunes, blue ocean and green fairways in all the world. At 7,300 yards from the back tees, it can be as challenging as it is breathtaking. 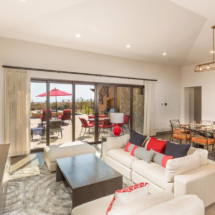 El Cardonal isn’t as close to the Pacific Ocean as the facility’s first course, the Davis Love III-designed Diamante Dunes, which is No. 52 in Golf Magazine’s world top 100. 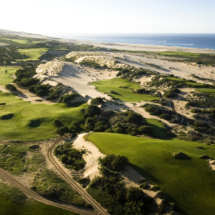 Rather, El Cardonal sits a bit higher, winding through dunes on the front nine. The first hole is a downhill par 5 framed by the blue water below. The back nine features arroyos (dry creeks or river beds), a tribute to the courses Woods played while growing up in California. He set up the strategy to make golf think and make choices. Regardless of the handicap, there are going to be different ways to play every hole. Angles of approach are going to be very important and will dictate the type of shots you should consider. grill, daily housekeeping, in-house shuttle and more.